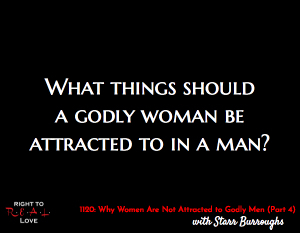 In this episode, Yahnathan concludes his discussion with author Starr Burroughs by addressing the question: What things should a godly woman be attracted to in a man? What things should a godly woman be attracted to in a man? The things a godly woman should be attracted to in a man. Why we need discernment from Yah in order to know the heart of a person. The vital importance of obeying Yah. Why we need Yah’s help to discern the right person for us. How to properly reprioritize our attractions. Starr explains how shifting her heart impacted what she found attractive. Examine your heart to determine why you’re attracted to what you are atrracted to. Write lists of your attractions. Submit your lists before Yah in prayer and ask Him to bring your attractions in alignment with what His best for you is.